Have you been thinking of starting a business in North Carolina? Well, then you are moving on the right track. Rated as the place that has the second lowest business costs by Forbes in the country, North Carolina is a great place to begin your business in. But if you want to start a business in North Carolina, you need to follow some specific steps. This step by step guide would help you do the right things so that you can give your company a kick start. Also, in case you get stuck on the way, you can always contact IncParadise to help you out with things. The very first step to start a business in North Carolina is to choose the right business idea that you would be able to make successful. The best way to get the perfect business idea is to search for the one that suits your natural abilities, your personal goals and your interest. With this, you would stay motivated when things become tough for you and it would also help you become successful. This is because you would love what you are doing and that is the main idea behind becoming successful in a business. You can either select an idea from these ones or pick up an idea that you have in mind and know that you would succeed in it. A business is made successful only when it is built with careful planning. So, before you can commit a huge amount of capital and any other resources for your business, ensure that you give time to analyze your business idea and create your game plan. The best way to do this when you want to start a business in North Carolina is to prepare your business plan. Product/Service Development: Under product development, there are many things that you should be clear about. So, in your business plan, add the answers to the questions like – what issues would your business solve? What is it that would make your service or product different from the others in your competition? By answering these things, you would be able to prove what makes your business better than the competition. This is important since it would help you in marketing your business and update your product plan in case you need to. Marketing & Sales: The next thing that you need to be sure about and answer in your business plan is the things related to your target market and how you would be selling the product or service you are offering. Here are some questions that would help you – who are your potential customers? How is it that would help you in getting their attention? Moreover, how would you convert the leads into sales? All this would help you prepare your marketing strategy which is an important part of any business. Partnerships & People: Other than talking about the marketing strategy and product development when you are about to start a business in North Carolina, you would also have to talk about the people that would be in the company. Like who the partners would be and which employees do you need. Here are some questions whose answers can help you fill out this part in the business plan – what roles would you need to hire for your business? What professional relationships would you need for your business to succeed? Financial Planning: Once all these things have been clarified in the business plan, you would also need to talk about the financial aspect of the company. Planning your finances would help you a lot, otherwise, you can end up using all the money on things that are not important and the company can fall under a debt and fail. So, it is important to prepare a financial plan as well. And for this, you would need to add answers to questions like – how many sales or clients would you need to get the amount that would help you break even? How much capital would be needed to reach to the place where you begin to profits? Where do you plan to get the funding from? With the answers to these questions, you would have a clearer idea for your business. This would help you walk towards success. Protection from any personal liability in case the company goes under debt, is liquidated, or is sued. It has an increased credibility. This is the reason why the small businesses find it much more better to register their company as an LLC. And as compared to any of the other business entities, the LLCs are much more easier to set up and manage. Additionally, they also have a favorable tax treatment. With this said, it is a great idea for you to incorporate your business as an LLC. And if you decide to do so, the cost for incorporating your business as an LLC in North Carolina is about $75. Furthermore, IncParadise can help you have it done in an easier what while you are sitting in your hometown or country. DBA means “doing business as,” and is usually referred to as the “assumed name,” “fictitious name,” or “trade name.” By filing your company for the DBA, you would be allowed to run your business under the name that you have registered it other than your own legal name (also called registered business name). A registered business entity that wants to rebrand itself so that it can reach out to a new market or in case the company wants to describe an entirely new service or product. An unregistered business wants to operate under a name that is different than the legal name of the person who is operating that business. A lot of the LLCs simply run their business under the name that they register it with at the time of formation of the business. Whatever you decide, ensure that you have your business registered with the government. Also, do not forget to get help from any professionals like IncParadise. Just like a person needs the Social Security Number (SSN), every business needs a Federal EIN, which is also called the Tax ID Number. The EIN would be used to identify the business during the federal tax filings. In short, the IRS needs a company to have the EIN so that they can determine the details of the business with the EIN. A company that does not have an EIN would not be able to hire any employees or open a business bank account as well. Hence, it is an important thing that you need to file for and obtain before you move ahead and run your business after your start your business in North Carolina. Sales Tax: In case you are selling any physical product in North Carolina, you would need to registered for the Sales Tax in North Carolina. Employee Withholding Tax & Unemployment Insurance Tax: In case you are hiring employees in your company, you would have to register for the Unemployment Insurance Tax along with the Employee Withholding Tax on the behalf of the employees that you have hired. For more tax details, you can contact the North Carolina Secretary of State or IncParadise. The next step to start your business in North Carolina is to open an official business bank account. Using the credit accounts and the business banking account is something very important in case your company is an LLC or corporation. This is what helps you keep all the business expenses separate from your personal expenses. Open a business bank account: This would separate your business assets from your personal ones. Additionally, it also makes the tax and accounting filing easier. Get a Business Credit Card: It is also great to get a credit card which would also help in separating the personal and business expenses. This would also help in building a credit history for your company that can be used gain a loan later on. The next thing that you would need to do after you start your business in North Carolina is to get the applicable licenses and permits that you need. For you to be able to legally operate a business in a place, you would have to comply with the local, state and federal government regulations. These includes getting a license or permit to run a business. For instance, if you have a restaurant, you might need to get the signage permits, building permits, health permits, etc. For you to be able to start your business in North Carolina, you would need to follow these steps and complete all the legal details needed. For this, IncParadise can help you. 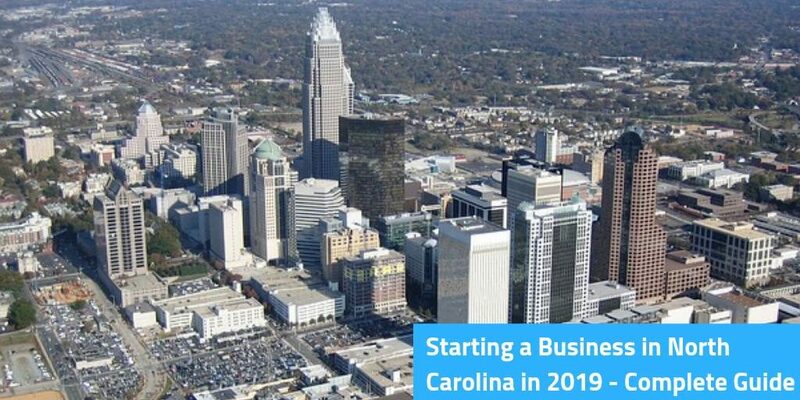 As soon as you have your business idea and plan ready, connect with IncParadise to have your business incorporated and registered in North Carolina easily! Like what you're reading? Get fresh tips to start & grow your company.